I seem to have gone a bit AWOL lately on this blog. Again … But things will pick up in the new year. 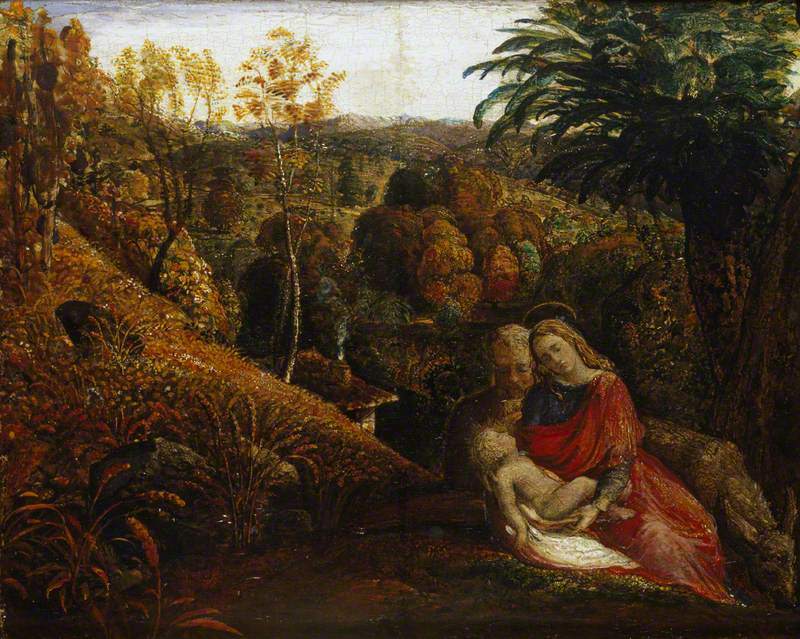 Meanwhile, here’s Samuel Palmer’s tiny, bejewelled Landscape with the Repose of the Holy Family, or The Rest on the Flight into Egypt, as it’s also known, tucked away in a corner of the Ashmolean. The palm tree(?) at the right seems as much of a late intrusion into the Kentish vales as is the holy family, who are plonked, maybe a bit awkwardly, at the foot of one of Palmer’s trademark diagonals. But are they really refugees on their way to Egypt? No donkey, and it all seems oddly relaxed, settled and timeless … Less of a flight than an arrival. It’s almost as if Palmer had a little landscape going spare, smoke from the cottage chimney and all, into which they have been visualised and inserted, not as an apparition but as an inculturation. It’s their cottage. In Palmer’s world, the holy lamb of God really is seen on England’s mountains green; waking from a nap, the divine countenance looks up at his mum and dad, then out across our clouded hills and pleasant pastures. Happy Christmas! In the full sense of those two words.